After experimenting with Photoshop for hours, I found this very cool trick that can be used to enhance your photos and make them more eye-catching. If you have a picture in which you want to make one particular object the central focus, you can make the photo black and white, with only that object in color. This will draw a viewer’s attention to just that object and make the color pop. Step 1: Open your image in Photoshop. Step 2: Once you open your desired image in Photoshop, go to the <Layer> menu on the top of the page, then go to <New Adjustment Layer> from the drop down menu, and choose the <Channel Mixer> option. The following dialog box will appear. Click “OK”. 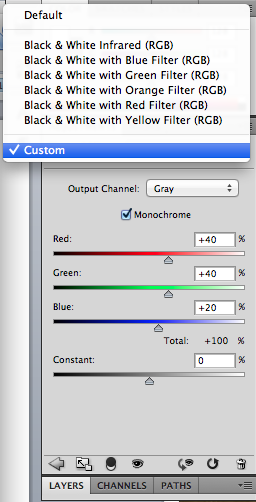 Step 3: In the side bar, choose the “custom” option for the channel mixer, and make sure that the Output Channel says “gray.” Also checkmark the “Monochrome” option. 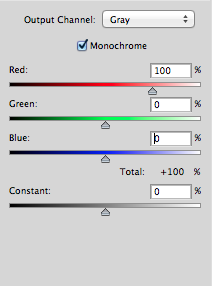 Step 4: Adjust the values for the red, blue, and green channels. Red should be 100, and Blue and Green should be at 0. Once you’re sure that all the values are correct, you’ll see that your image is now in black and white. Time to make some parts of it colored again! Step 5: Check the foreground and background colors. You need to make the foreground color Black, and the background color White. You can do this from the tool bar on the bottom left side of the screen. 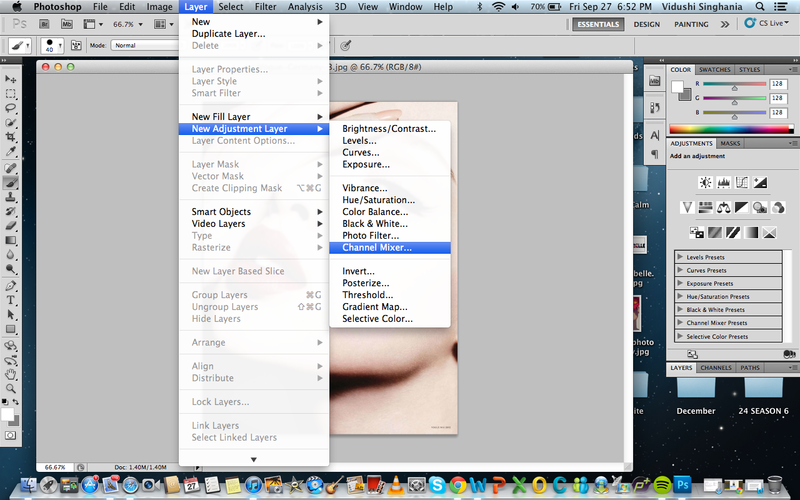 Step 6: Select the zoom tool from the left side menu bar (or press Z on your keyboard). Zoom into your image so that it is large enough for you to work with. Zooming into the image makes the area you need to work on larger and clearly visible so when you use the brush tool next, your colored areas are neater. Step 7: Next, select the brush tool from the left side tool bar (or B on the keyboard). 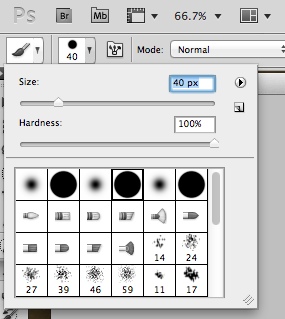 Step 8: Adjust the brush size (from the top left of the page) until you have something that is easy to use. You can keep changing the brush size. I would recommend using a larger size for the center portions and a smaller size for the edges/corners so you have more control over the brush tool. 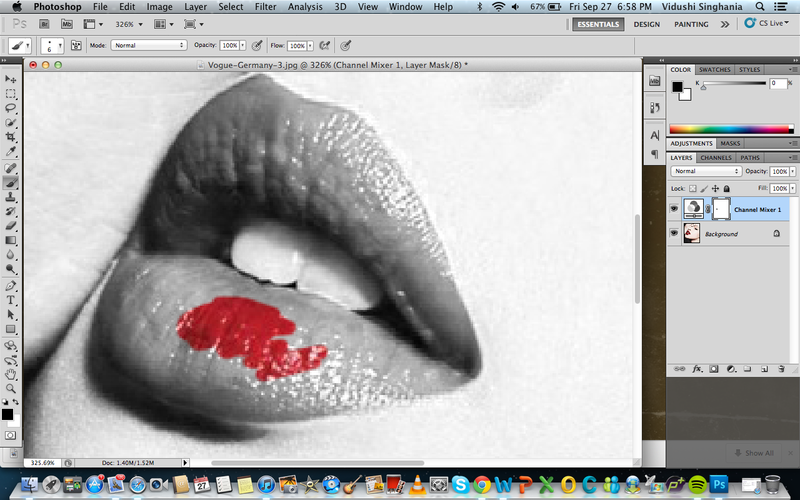 Step 9: Using the brush tool, fill in the parts where you want your color to show. For this image, I chose to only have the model’s lips appear in color. Once you’re done filling in the area, zoom out and check to see if you are satisfied with the image. Step 10: Save the image and you’re ready to go! To save, click Ctrl+S on a PC, or Command+S on a Mac. You can even Save from the <File> menu on the top of the page. And your image is ready!! In 10 simple steps, you’ve managed to make your image go from regular to WOW. This tip is great for those images in which you want to make one particular color stand out, or draw attention to one part of it. ~ by vs1085 on September 27, 2013.